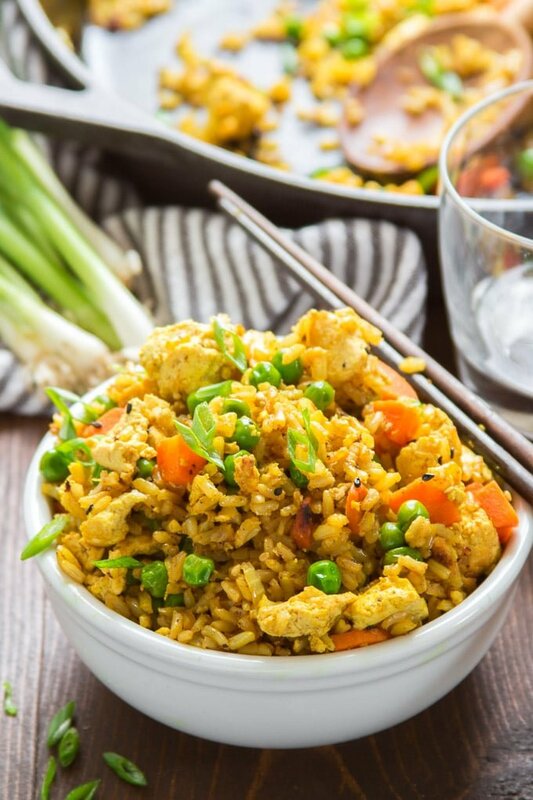 Fried rice is one of my favorite easy weeknight meal secrets. And no, I’m not talking about the kind you get delivered in a paper carton. Homemade fried rice is generally quicker (under 30 minutes to make! ), better and almost as easy! Here’s the thing: fried rice comes out best when it’s made with leftover rice. Rice that’s been in the fridge for a day or two tends to get a bit dried out, so it gets super crisp when you fry it, with nice distinct little grains. So any time I’m cooking up something for dinner that involves plain old rice, I make a double batch. That way I’ll have some leftover rice to make fried rice with later in the week. Another thing homemade fried rice has going for it: flavor variations. Plain old fried rice with soy sauce and garlic is good, but it can get boring. When you make it at home you’ve got all kinds of options on how to season it up! Adding a little curry powder is one of my favorite fried rice variations.